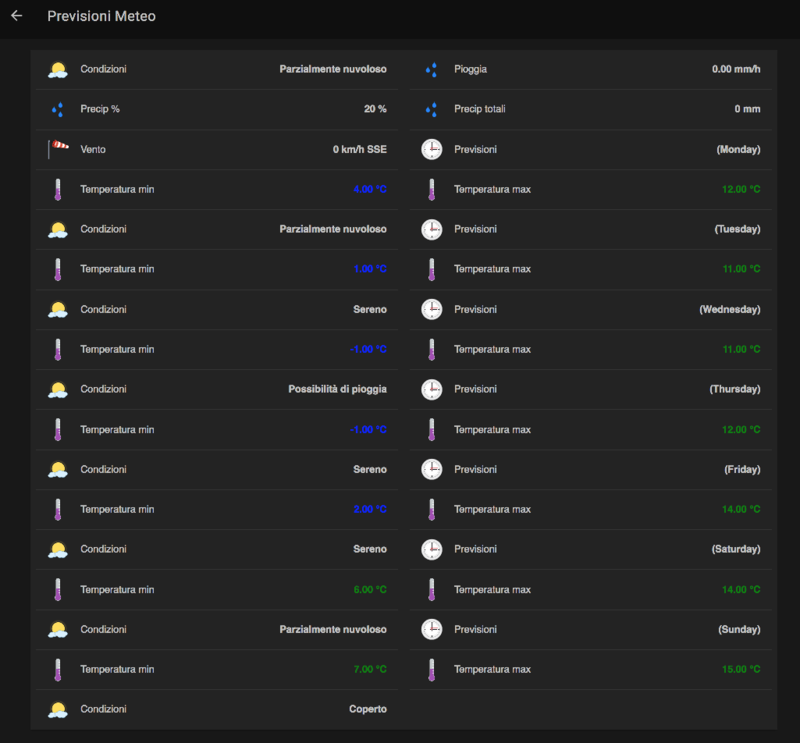 The example supplied with the SD card uses the Weather Underground free services to get weather forecasts and the related binding to link them with OpenHAB. Note! This example uses a Weather Underground demo API key that can stop working at any moment. Please get and install your own API key to have a stable service. 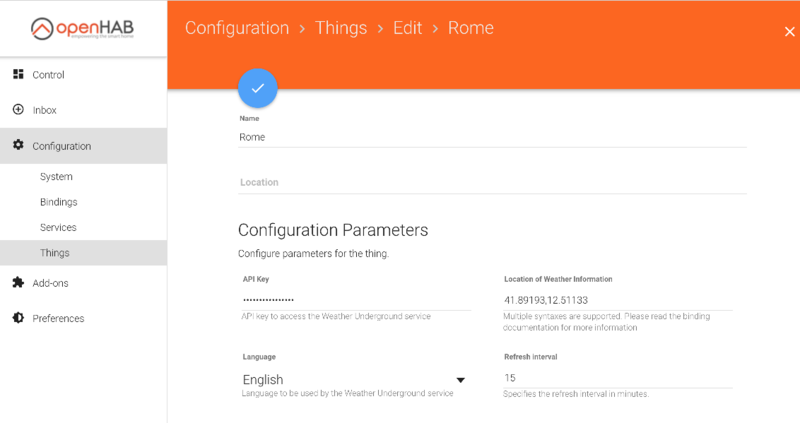 Create a free account on Weather underground, get an API key and past it to the binding configuration page together with your coordinates. That’s all, when the binding status becomes ONLINE the things are published and they can be linked to OH2 items in items/weather.items. To change the language, displayed items and so on, edit this file and sitemaps/cm3home.sitemap. A more complete information panel is designed in the example supplied using also the informations coming from Astro binding. This binding too requires the editing of the configuration inserting your coordinates. to customize the items names, edit the items/astro.items file. Read carefully the official Weather Binding documentation. This is an OpenHAB 1 binding, it works but requires some workarounds. 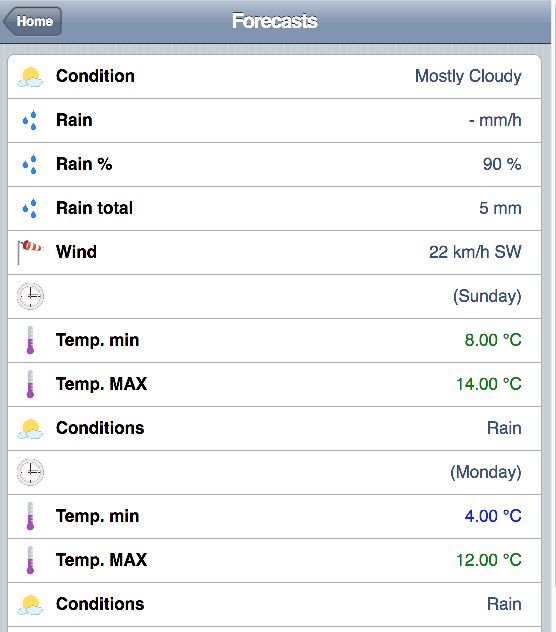 With OpenWeatherMap service the forecasts do not work anymore. On OpenWeatherMap web site they declare that with the free plan there are also the 5 days forecasts but after the registration they are set to 0. Reading on forum you can discover that the forecasts (day by day selectable) are only the 16 days one. Switching from beta to final version the 1 day forecast is no more included in free plan. 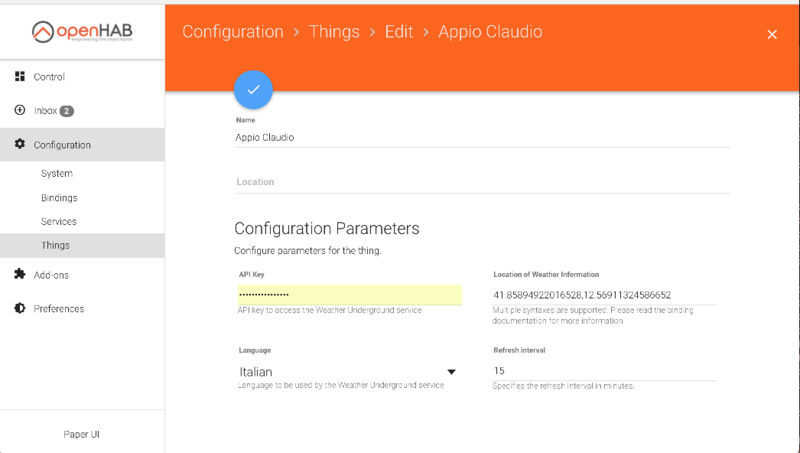 The OpenHAB binding still uses the old APIs that are no more included. It’s no more possible to specify a single day but only the full 5-day period. 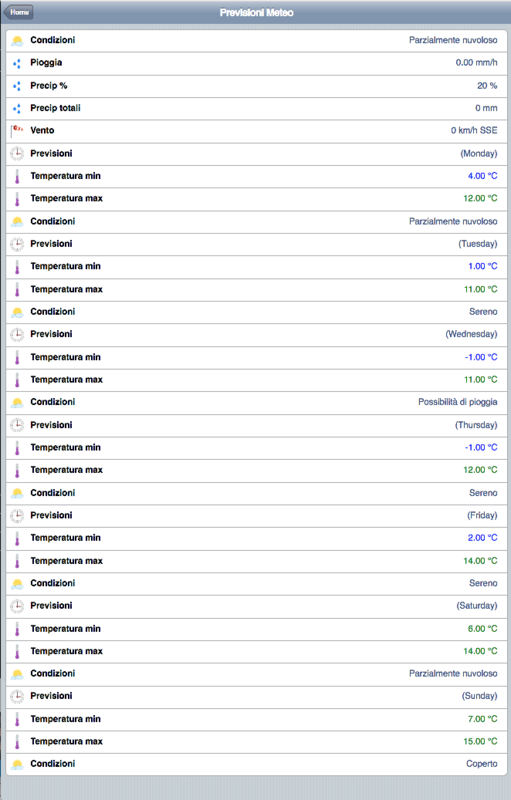 After some tests with OpenWeatherMap service I switched to Wundergound service. It’s easy. After creating a new account on another service provider you can find/change the new name on all items configured or comment the old one and use the same name on the new configuration without changing anything else. 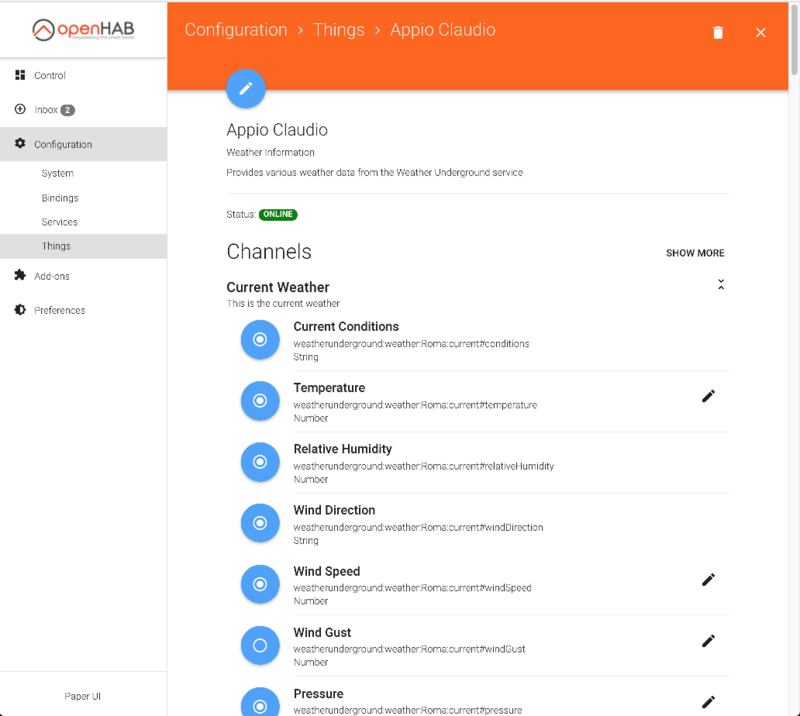 Using the HTML panel example on the Weather Binding documentation requires some tricks, learned on the OpenHAB community, because in OH2 the folder used to publish web pages changed from the one of OH1. in order to be compatible with all the weather services that also provide the icon names in forecast. Some services supplies a link to their own icons instead. Recently a new, OH2.2 compatible WeatherUnderground Binding is available. It uses the new things system and is easier to config. 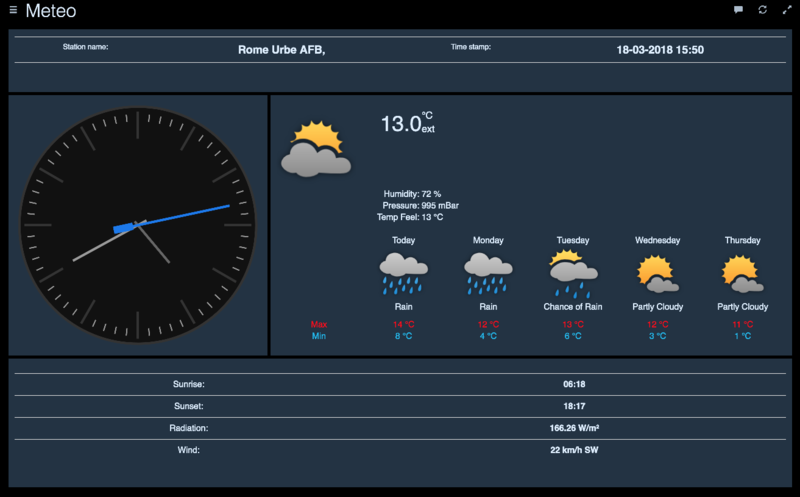 The data can of course be integrated with local measurement, and displayed together on an habpanel.